PHOENIX – When responding to fires in high-rise buildings, firefighting crews of five or six members—instead of three or four—are significantly faster in putting out fires and completing search-and-rescue operations, concludes a major new study* carried out by the National Institute of Standards and Technology (NIST), in cooperation with five other organizations. Results of the study, conducted with 13 Washington, D.C.-area fire departments, were presented today at the 2013 Metropolitan Fire Chiefs Conference in Phoenix. 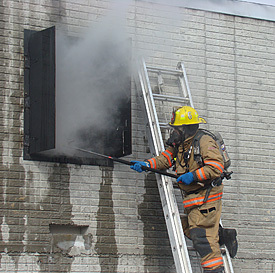 "Unlike most house fires, high-rise fires are high-hazard situations that pose unique operational challenges to fire service response. How big a fire gets and how much danger it poses to occupants and firefighters are largely determined by crew size and how personnel are deployed at the scene," says lead researcher Jason Averill, a NIST fire protection engineer. "It's not simply that larger crews have more people. Larger crews are deployed differently and, as a result, are able to perform required tasks more quickly." An analysis of 14 "critical tasks"—those undertaken when potential risks to building occupants and firefighters are greatest—found that three-member crews took almost 12 minutes longer than crews of four, 21 minutes longer than crews of five, and 23 minutes longer than crews of six to complete all tasks. Four-person crews took nine minutes and 11 minutes longer than five- and six-member crews, respectively. WASHINGTON D.C.--A landmark study issued today by the U.S. Department of Commerce's National Institute of Standards and Technology (NIST) shows that the size of firefighting crews has a substantial effect on the fire service's ability to protect lives and property in residential fires. Performed by a broad coalition in the scientific, firefighting and public-safety communities, the study found that four-person firefighting crews were able to complete 22 essential firefighting and rescue tasks in a typical residential structure 30 percent faster than two-person crews and 25 percent faster than three-person crews. The report is the first to quantify the effects of crew sizes and arrival times on the fire service's lifesaving and firefighting operations for residential fires. Until now, little scientific data have been available. "The results from this rigorous scientific study on the most common and deadly fires in the country—those in single-family residences—provide quantitative data to fire chiefs and public officials responsible for determining safe staffing levels, station locations and appropriate funding for community and firefighter safety," said NIST's Jason Averill, one of the study's principal investigators.